Stress Management and Body Maintenance for Your Horse ! IMPORTANT – Holistic therapies treat the animal as a whole (mind, body and spirit) and are complementary to veterinary advice, enhancing other treatments by allowing tension release and natural improvement in both physical and non-physical conditions. 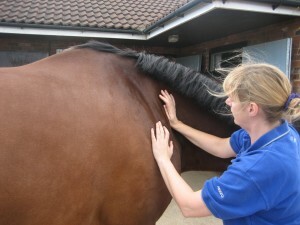 If you suspect injury or physical ailment, you must seek diagnosis from your Vet in the first instance. 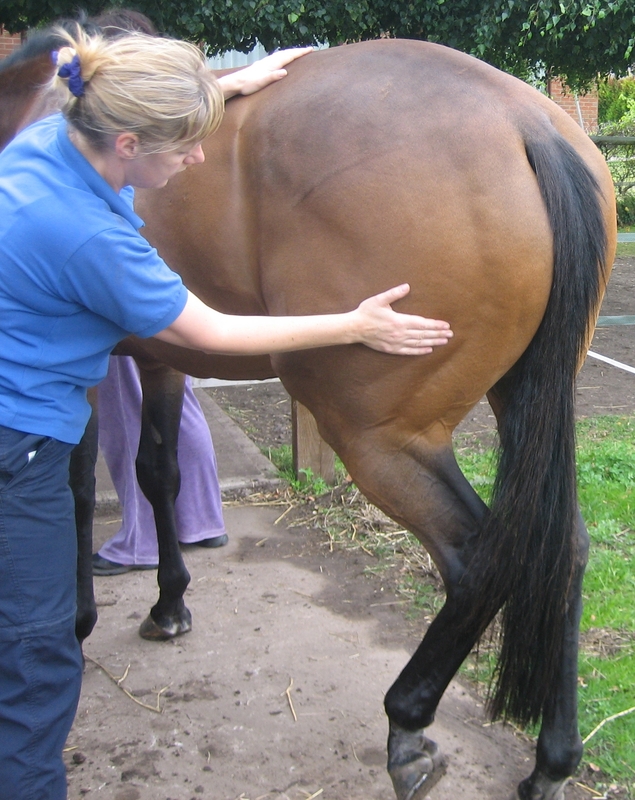 Any physical therapy requires, by law, your Vet’s permission to ensure there are no underlying medical conditions and that the therapy is safe and has the best interests and welfare of your horse in mind. 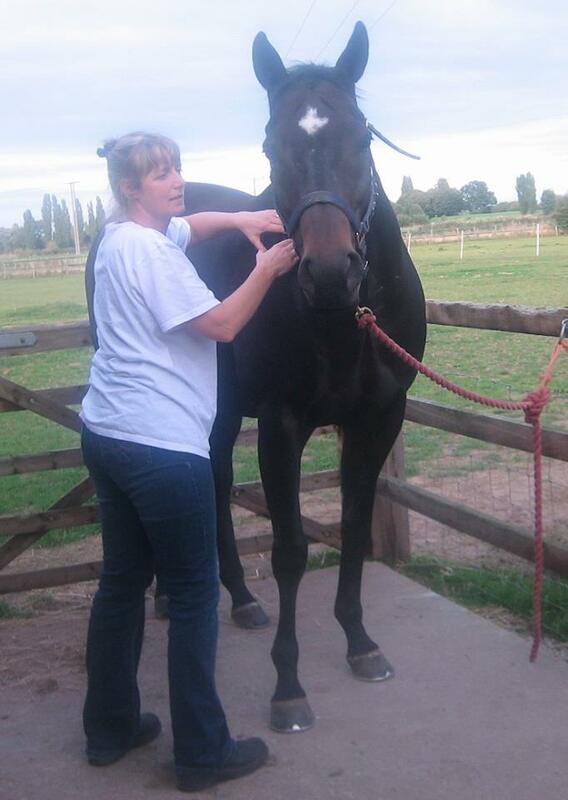 NB: Hayley always liaises with your veterinary practice prior to visiting any equine and provides a brief report afterwards too for you and your veterinary practice. 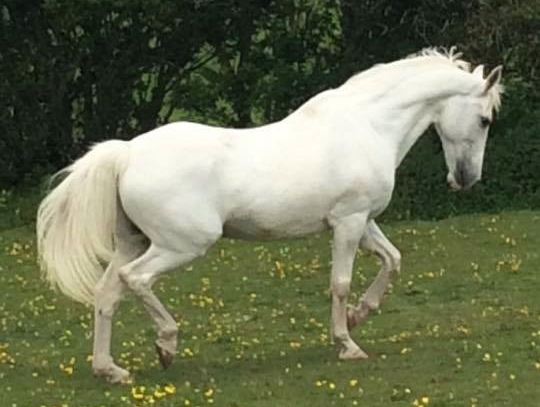 Mike Austin’s stunning Spencer (below) received therapy before turnout after long-term box rest for a suspensory ligament injury and this helped to keep him fairly calm and reduce the risk of him hurting himself again. 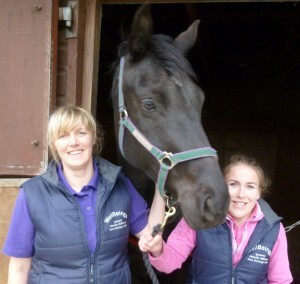 Hayley’s life-long love of horses means she has a particular passion for her equine work and enjoys working with much loved equines from family pets to top competition horses. 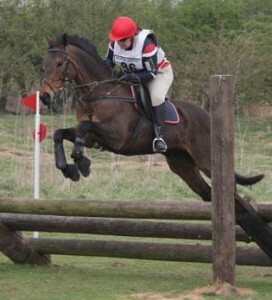 Equine Holistic Therapy can assist performance in work and help a balanced attitude. 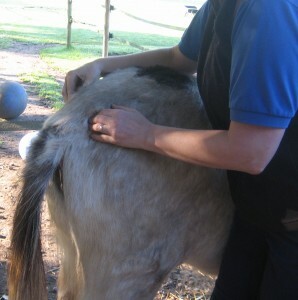 The combination of Equine Massage and Reiki complement one another perfectly. If, for any reason, massage cannot be used then Reiki can be used in isolation. Hayley initially assesses the horse using a combination of observation, palpation and intuition to provide a therapy adapted to the preferences and needs of the individual equine and always works with integrity and respect. Most horses display a whole array of signs of relaxation including resting a hind leg, sighing, yawning, snoozing, gurgling abdomen and breaking wind. Rarely they indicate they are unhappy and the therapy is adapted or even ceased if necessary. 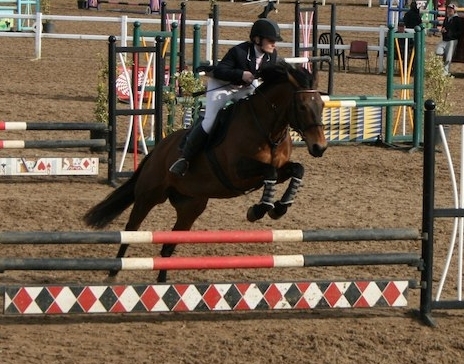 Safety of the horse and those around the horse is of paramount importance. Massage is a form of physical therapy working soft tissues (muscles, tendons, ligaments and fascia) in a rhythmic, relaxing way to relieve tension. All muscle groups are worked to ensure a holistic and complete physical treatment, since all areas of the body are connected to and affect all other areas. Passive stretches are incorporated as needed. 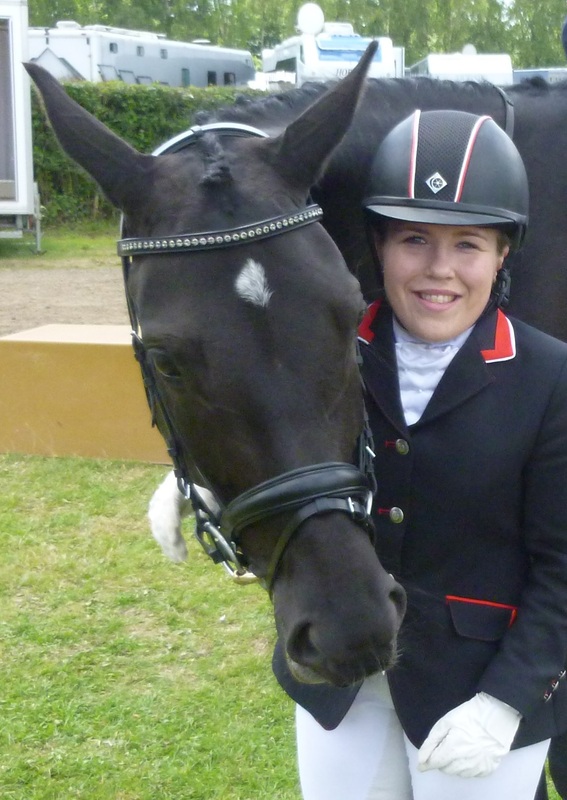 Hayley gives useful exercises and self-help tips you can use with your horse and most equines really appreciate this additional quality time with their person, strengthening their bond, mutual respect and trust. As well as being useful for physical issues, these therapies are particularly helpful for anxiety or stress related problems eg. 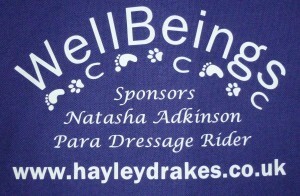 grief, injury, illness, box rest, depression, bullying or past issues. 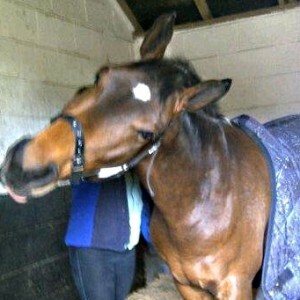 The calmer horses (and humans) are, the less likely they will suffer physical and psychological ailments. Benefits of massage include improved circulation, bringing fresh oxygen and nutrients for supple muscles, improved flexibility and muscle strength, improved fitness and performance and increased stability, balance and co-ordination. 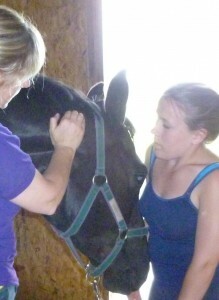 Imagine how you feel after massage and it is likely your horse feels similar. Reiki is a subtle, gentle, natural energy therapy which is great for deep relaxation and releasing tension. It may sound like a bizarre kind of treatment, however, feedback and experience shows that all animals seem to enjoy this calming energy work, which is particularly useful for helping with any anxiety or stress related issues. Hayley’s style is quiet, intuitive and subtle – often ‘less is more’ – though deep tissue massage work is used throughout and the combination of deep work, light work and some stillness is very effective. (left) Claire Cooper’s Whalton Razzamatazz (HOYS Small Hack of the Year 2012) enjoying the shoulder work and leaning into the pressure. Flicker is having a great release of tension during his therapy with multiple yawning and had been very uptight and tense prior to the therapy as the local very noisy game shoot had just passed by. Stressed or uncomfortable horses often relax and change to become happier, more confident and willing. Even when previously they have been anxious, unresponsive, uncooperative and maybe even ‘shut down’. 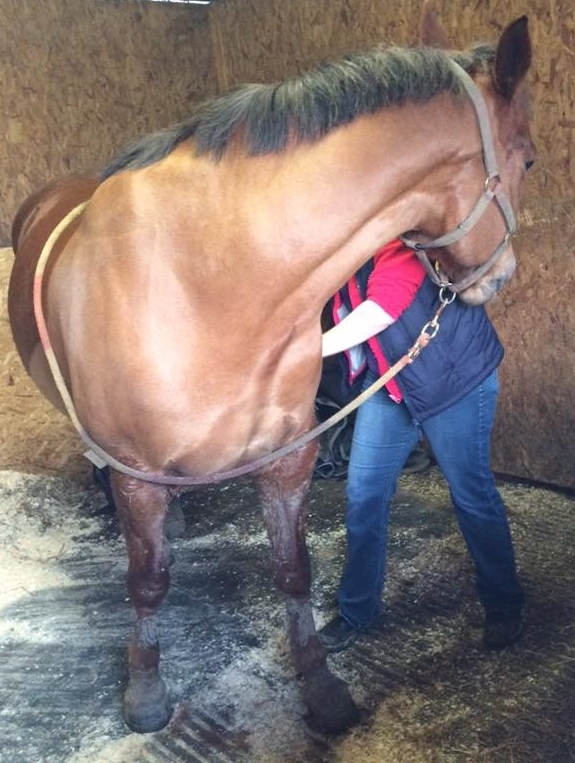 Therapies are great for maintenance and prevention of injury, keeping both you and your horse in tip top condition to perform well, whether you are a happy hacker or a keen competitor. We all know that our equine friends pick up on our stress and anxiety and vice versa. We often literally mirror each other’s behaviour. It follows that we should honour our strong connection and bond by working on both sides of the team. Massage and Reiki are great for helping achieve a calm and serene state for both parties. 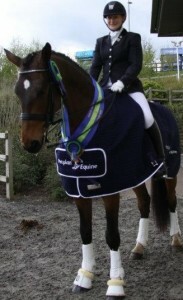 See Horse & Rider Packages page. 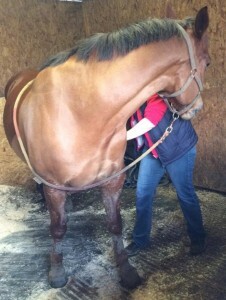 Clinic days for rider massage can be organised at your yard too for a minimum of 6 people. Discounts may be applicable for multiple bookings of equine massage and horse & rider packages. 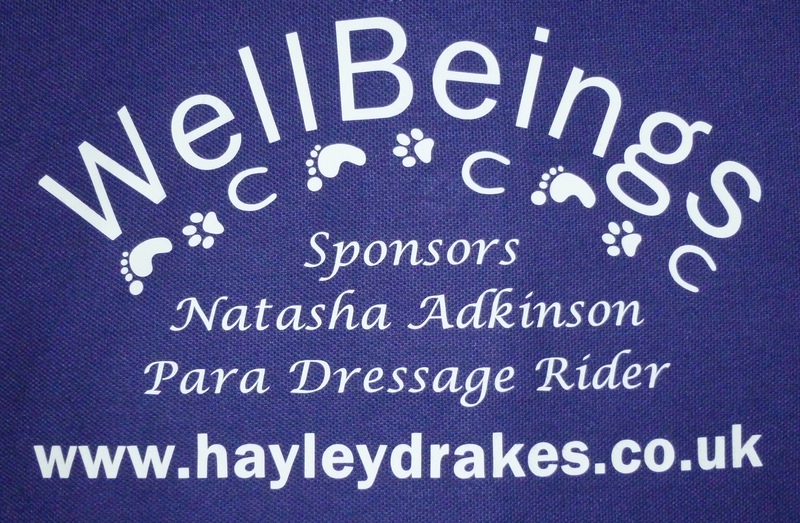 Prices start at £50 for Equine Holistic Therapy (£65 for the Horse and Rider Package) and small additional travel expenses may be applicable depending on your location. Discounts may be applicable for multiple bookings and clinic days of more than 6 riders for the Chair Massage. 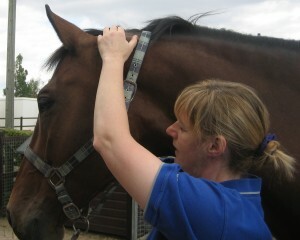 Equine Holistic Therapy will take about an hour and Chair Massage 30 minutes. Competition Package – Therapy can be used to aid travelling anxiety and as a warm-up or cool-down at competition. Prices for this will be dependent on amount of time Hayley is required to be at the competition with you. WHEN WOULD YOUR HORSE BENEFIT? 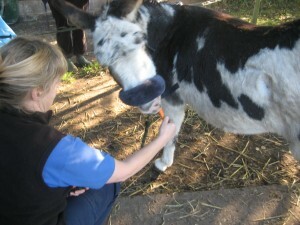 Remember – Any undiagnosed abnormality should be referred to your Vet in the first instance. 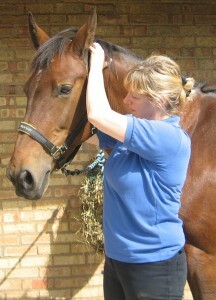 A Consultation Form is completed for your horse (and yourself if you are having a therapy too). This can then be reviewed at subsequent visits. As Massage is included in the Equine Holistic Therapy Hayley offers, and this is a form of physiotherapy, permission will be sought from your Vet prior to the therapy to establish if there are any diagnoses which may mean the therapy is inappropriate and unsafe for your horse. This complies with the following legislation: 1966 Veterinary Surgery Act and The Veterinary Surgery Exemptions Order 1962. Hayley will write a short report to be sent to the Vet following the therapy. Please bring your horse in and groom him/her. 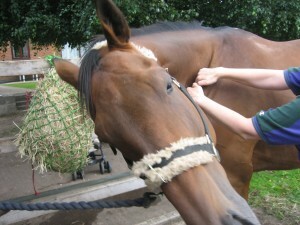 Have a haynet handy and a friend nearby so your horse feels settled . 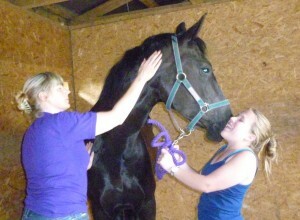 You remain present during the therapy though not always necessarily to hold the horse. Anyone observing can feel very relaxed too. 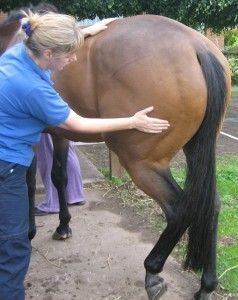 This list of contraindications is not exhaustive and you should always discuss concerns with your Vet prior to booking any therapy: Azoturia; Systemic Infection; Immediately after feed; Undiagnosed Abnormality; Lymphangitis; Some Cushing’s Syndrome (depending on symptoms and drugs being used); Day after strenuous work eg. hunting; Pregnancy; High Temperature (over 102 F or 39 C); Severe functional nervous disease (eg. tetanus). The affected area will be avoided in the case of localised skin infection; cysts/sarcoids/tumours; acute arthritis; rheumatism; calcification of joints or soft tissues (eg. splints, ringbone). History of stifle lock means hind leg stretches are contraindicated. “We were delighted when Hayley joined our small team supporting Natasha and Cally on their ‘Road to Rio’. Hayley plays an important role in keeping Cally in tip top condition ready for her intensive training and competition schedule. 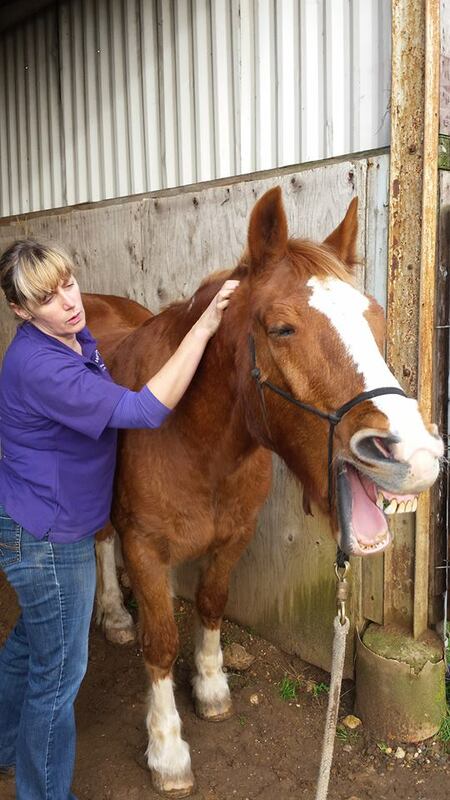 Landy also loves his massage with Hayley, especially liking the ‘apple stretches’ with specially adapted apple sticks.